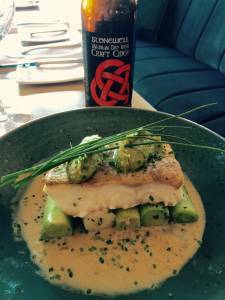 We thought with Mother’s Day coming up that now would be a perfect time to share our delicious recipe for Fillet of Cod with Leeks and Stonewell Cider which we made with Pearse the Head Chef from Toddies at the Bulman in Kinsale, Co. Cork. It really looks impressive, allowing you to recreate restaurant quality at home. This recipe is for two people but it can be easily adapted to serve more as necessary. Cut the leeks into a barrel shape (about 2 cm long), peel off the first layer on each one and place them in a baking dish. Next dice half of a shallot and add to a heated pan with melted butter. Add about 200ml of Stonewell Medium Dry cider, and salt and pepper to the pan, mix togther and then pour over the leeks in the baking dish. Top the dish with chopped thyme, cover with tin foil and bake for 20 minutes at 200 degrees. Chop and dice the other half of the shallot and two leeks, melt butter in a pan and add the shallots and leeks cooking them until they are soft. Then put the mixture into a blender and blitz until smooth. Finely chop a small bunch of chives and mix with the leek puree. To prepare the cod place it on on a clean chopping board with the skin facing up, make three small cuts in the skin and then dip in the flour just before frying. Heat the oil in the pan and fry the cod for three minutes each side, then place in the oven for 10 minutes to cook through. Chop another half of a shallot, add to a hot pan with melted butter and fry until soft. Add 100ml of Stonewell Medium Dry Cider, 100ml of cream, two table spoons of fish stock and whisk togther, squeeze in the juice of half a lemon and heat the sauce through. Place the leeks on a deep plate, place the cod on top with the skin facing up, top with leek puree and whole fresh chives and finish with sauce around the dish. A glass of Stonewell Dry or Stonewell Medium Dry would be the perfect accompaniment for this dish.